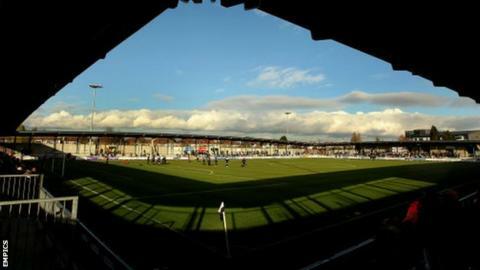 Dartford boss Tony Burman has vowed that Grimsby will not have an easy passage to the FA Trophy final. The Mariners beat Dartford 3-0 in the first leg of their semi-final, with the return match at home this weekend. "We've got to get four goals," Burman told BBC Radio Kent. "We'll make it uncomfortable for them. "As much as their crowd was great for them and let's hope our crowd will make them feel uncomfortable. The onus is on us to have a go at Grimsby." He continued: "They'll want to catch us on the break but it's always been a two-legged affair and we have to have a go." Dartford were doing well with five minutes to go of the first leg, having contained the Blue Square Bet Premier leaders to a 1-0 lead, but two late goals left them facing a major task to turn things around in the return. Their disappointment was compounded when Lee Noble was sent off in stoppage time after clashing with Grimsby defender Aswad Thomas. "You do get a second bite of the cherry," Burman added. "We're down because of what happened in the last 10 minutes. "It was a mad 10 minutes when we should be keeping our composure and taking them back 1-0 down. "We're 3-0 down. We've got to go for it at home now." One potential plus for Dartford is that they have no midweek fixture to distract them, whereas Grimsby travel to Braintree on Tuesday evening. "By next week we will have recovered and feel like we're still in with a shot," he told BBC Radio Kent. "Once we've had a week to think about it, we'll give it everything we've got."